The set of medieval gravestones was discovered in the graveyard of Govan Old Parish Church with the monuments dating to the 10th and 11th Century. They hail from the time when the area was a political and religious power center on the Clyde and now form part of the nationally important Govan Stones collection. The find been hailed as the most exciting of its kind in the last 20 years that relates to the old kingdom. 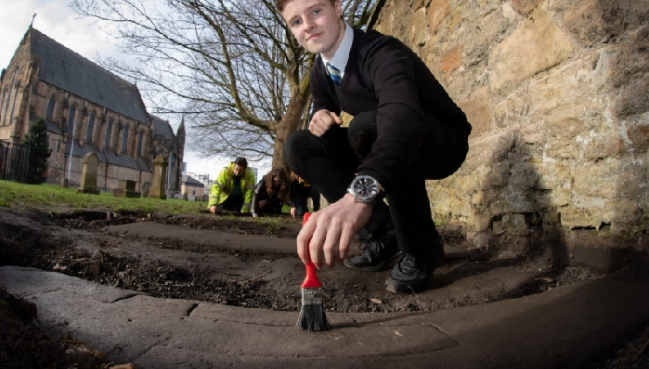 Mark McGettigan, a 14-year-old pupil at Lourdes Secondary School, was helping out with an archaeological survey of the area when he made the discovery. The budding archaeologist said he was “ecstatic” after his find was confirmed as being the missing Govan Stones.